The focus of the film is an internal investigation regarding police partners Briggs (Chris Klein) and Shepard (Adam Rodriguez). While following-up on some mysterious deaths in gang territory, the two plainclothes officers get involved in a shoot-out, where weapons are discharged mysteriously from different points (crossfire) at the crime scene. The rest of the story is told in flashbacks, involving a prime informant name Tino (50 Cent) and a slimy trail of corruption and violence. Director Brian Miller – who also wrote the screenplay and has a role in the film – will be introducing Caught in the Crossfire and making an appearance next Tuesday, August 3rd, at the Midwest Independent Film Festival in Chicago. HollywoodChicago.com talked with Miller via phone from Los Angeles, in anticipation of the screening. HollywoodChicago.com: What event or circumstance in real life inspired you to write the screenplay for Caught in the Crossfire? Brian Miller: Basically I was a huge fan of crime thrillers when I was a kid growing up, like ‘Miami Vice’ and ‘Crime Story.’ When I began working on the screenplay I was still in film school in Michigan and I was bartending at the time, and I was dating a female police officer. She told me stories that were absolutely unbelievable, and since I was always writing crime-type thrillers, and she gave me a lot of information that I could then utilize in the film. Also over a ten year period, I was moving all over the country. During that time I met with former law enforcement officers and career criminals. I would get these guys to talk to me and a lot of what is in the screenplay is based on those stories I heard from them. HC: How important was it to get a nice “street feel” for the atmosphere of the movie. Even though it was Anytown, USA, what city inspired the look and the circumstance of the atmosphere? BM: I grew up in Grand Rapids, Michigan, and as a filmmaker that city offered us a great production value, because it has a very specific feel. The city buildings have the old brick and mortar facades, it’s got cobblestone streets and it has old warehouses that would have cost millions of dollars to build as sets, if we were to match what we were getting there. HC: This was your feature directorial debut. What basic directorial philosophy did you adhere to throughout the shoot and what are your prime methods for pre-production and shot selection? BM: The key for me is concept. As a kid in my late teens and early twenties I studied in theater mostly. I was taught at a very young age to stick to concept, especially in theater. And that’s why I wanted to create a very gritty crime thriller – so everything we do, from the production design, to the lighting design, to the score, the location, even the wardrobe – all of that has to fit into the concept. If Chris Klein and Adam Rodriguez were wearing ‘Miami Vice’ pastels, it would have thrown off the whole thing. [laughs] Everything during the shooting process through post production fits into that same concept. 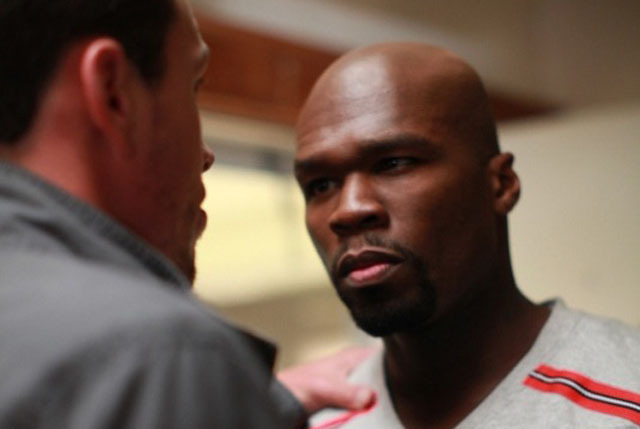 HC: This seemed like a transition film for both 50 Cent and Chris Klein. What do you think as actors they wanted to achieve in this transition and how did you accommodate them in that effort? BM: I have absolute respect for all the actors on this project. I needed 50 Cent, literally. His character was based very loosely on some real people, who were informants. It’s highly fictionalized, but I needed somebody that could connect to that character and bring truth to it. I could have gone to several actors, but I was blessed through Randall Emmett [the producer] to offer me an opportunity to work with 50. He was absolutely fantastic to work with, professional and he really brought a lot to the table. Chris got the script at the right time, he told me. He connected with the character and wanted to do a gritty thriller. People had always seen him as the ‘funny guy’ and he does that well, but when we first started doing early screenings of the film, people were blown away what they saw with Klein, they didn’t expect that kind of performance from him. HC: Adam Rodriguez was truly transcendent in the role of Shepard. What do you think he understood about his character that didn’t appear in your screenplay? BM: I love Adam Rodriguez, he is the most charming, charismatic and professional human beings I have ever met in my life. I wrote a very specific character, I needed an actor that could play that specificity. He created a back story for himself and the character even before he came to Grand Rapids, and we talked about it, and he played it in so many different dimensions. There were times during the production when I didn’t want to give him any direction, because he was just nailing it. HC: The Thin Blue Line is an overriding theme in our moral exploration in many art forms. What is it about cops, the protectors of society over anarchy, that maintains a fascination with film, TV and other forms of art? BM: I think it’s always because they are walking that fine line. Could you imagine getting every morning, strapping on a gun and a bulletproof vest and heading into work, where you might come back at the end of the day? Guys who are on that line are like our military and they go through tremendous pressures. HC: What do you think is in the pure make-up of a cop’s job that subjects them to elements that could corrupt their souls, and makes them indistinguishable from the very bad guys they are purported to protect us against? BM: The things that police officers see, what they experience, and the emotional pull that impacts them are all factors, including a relatively low salary. There are elements in this film about justice and the system, as in when the police do their best to take down drug suspects and put them into prison, yet a faulty criminal justice system lets these suspects go. Eventually they say to themselves, ‘how else are we going to do this?’ That’s what we see in the film. HC: Crossfire is used often to deceive where shots are coming from, as in some political assassinations. How did you utilize crossfire in your story? BM: It created suspense for the audience. 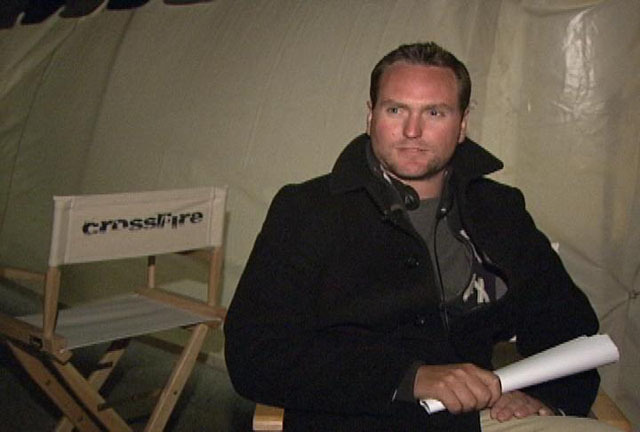 One of the keys to the story, one the concepts of the film is in the title – Caught in the Crossfire. Because visually and with the sound, I am trying to pull the audience in the crossfire scene with these characters. I don’t like action movies where the audience steps back and just watches what happens. I bring them into the crossfire, into the police car and they feel the impact of the bullets flying around. That’s why I shot the scene that way. HC: I previewed the film on pay-per-view. What do you think of these new methods of distribution that isn’t necessarily the traditional movie theater? BM: We look at society today – with handheld devices, DVDs, downloads and everything else. It just provides a mechanism to capture a wider range of audience, and more people can see the film. “Caught in the Crossfire,” written and directed by Brian A Miller and featuring Chris Klein, Adam Rodriguez and Curtis “50 Cent” Jackson, will have its Chicago Premiere at the Midwest Independent Film Festival this Tuesday, August 3rd, at the Landmark Century Cinema.